The Lazarus Corporation is an outpost of artists & writers whose work is characterised by an intriguing combination of visceral aesthetics, intellect, and a determination not to be assimilated by monoculture. It is not a formal collective, but rather a means to curate and promote this artwork & writing. It aims to resist the infantilisation of culture - whether that be intellectually “dumbing down” or the growing demand to sanitise culture, leaving it by turns insipidly bland and sickly sweet. The Lazarus Corporation is a defiant counteraction. There are few websites on the internet that I consider worthy of more than a brief glance. The Lazarus Corporation has been designed to be one that would catch my eye and keep my goldfish-like attention over a prolonged period. It’s a growling, growing rock’n’roll beast of a website, informed by intelligence and aesthetic attitude. 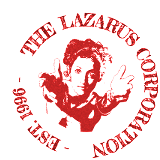 The Lazarus Corporation first appeared on the web back in 1996, an impudent blot on the landscape of the free webspace provided by my ISP of the time. Things changed: it got bigger, it got faster, it got more savvy to technology. Now it’s here, residing on some stable, fast commercial webhost. It’s still changing and mutating. Sign up to the Lazarus Corporation Email Newsletter to get updates on what’s new on this website, and details of any exhibitions or activities we’re involved in. We send out newsletters about once every 2-3 months, and we do not give your email address or other details to anyone else. You can also find us on Facebook, on Twitter, and Google+.